Royal Society for his contributions to structural biology. Walter and Eliza Hall Institute researcher Professor Peter Colman has been elected a fellow of the Royal Society, the UK’s national academy promoting excellence in science. Professor Colman was the only Australian to be elected a fellow in 2014, and was one of 50 elected this year. The Royal Society announces new fellows each year from the UK and Commonwealth who have made significant contributions in science, engineering and technology. New fellows are elected on the basis of their scientific achievements by existing fellows of the society. Professor Colman’s interest in the molecular warfare between viruses and their hosts led him to determining the three-dimensional structure of the influenza virus protein neuraminidase in 1983 while at CSIRO. A major result of this work was his discovery of an unchanging part of the neuraminidase protein on the surface of all influenza viruses, suggesting a potential target for anti-influenza drugs. He led a team of researchers who discovered the anti-influenza drug zanamivir, marketed as Relenza, the first in a then new class of drugs for treating and preventing influenza. The so-called ‘neuraminidase inhibitors’ have been stockpiled by governments around the world as part of the planning for future influenza pandemics that is coordinated by the World Health Organization. Professor Colman’s recent work at the institute is focused on molecules involved in the programmed cell death pathway (also called apoptosis), solving their three-dimensional structures by X-ray crystallography and visualising their interactions with partner molecules that determine whether a cell lives or dies. Understanding the structure of these proteins at an atomic level is essential for drug discovery and development. Targeting specific molecules in the cell death pathway is being pursued as a way of treating a number of diseases including cancers, inflammatory and immune disorders and neurodegenerative diseases. 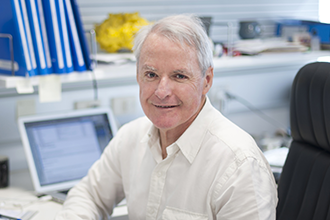 Institute director Professor Doug Hilton said Professor Colman had made significant contributions to understanding proteins and their structure throughout his career.